Are you looking for a siding option that’ll really make your home pop? Scalloped siding from Feldco will do the trick. Our vinyl scalloped siding offers a look you can’t get with any other style and durability you can’t get with other materials. What separates scalloped siding from every other style is that it’s not hard and sharp around the edges. In fact, it’s rounded at the bottoms. Scalloped siding mimics the look of scales on a fish and homeowners love the uniqueness it gives their homes. The most common use for scalloped siding is to accent certain features on homes such as gables and eaves. 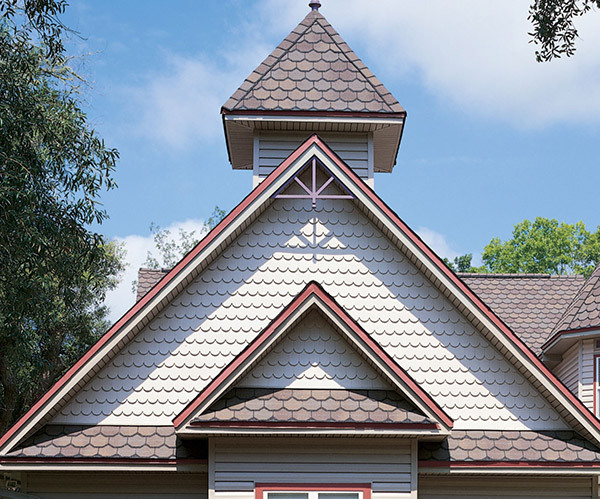 Scalloped siding from Feldco features many benefits that you won’t find with other companies. Our vinyl scalloped siding will wrap your home securely and tightly thanks to our foam board backing system. If you’re experiencing drafts with your current siding, then replacing it with our siding will surely get rid of those drafts. By not allowing unwanted air into your home, you’ll see a decrease on monthly heating and cooling bills because you don’t have to rely so much on the A/C or furnace. Another reason why Feldco’s scalloped siding surpasses anything else is because our siding is extremely durable and reliable. Thanks to the backing system, any shocks to your siding will be absorbed – preventing any denting, cracking or scratching. Since our vinyl scalloped siding is resistant to warping, rotting, swelling or cracking, you’ll have the assurance of knowing your home’s exterior will last a very long time. Another reason why your siding will outlast other materials is because the maintenance is kept to a minimum. Gone are the days of painting, staining and replacing rotted or warped sections of your home. Our vinyl scalloped siding never needs to be painted or stained because the colors are baked in during manufacturing. The only thing you’ll need to do is a good cleaning every so often. When Madison homeowners are looking for a unique style of siding to add to their home, they turn to Feldco’s scalloped siding. The rounded bottoms offer a look you can’t get with anything else. Plus, we have a wide selection of colors to choose from to match any home in Madison. With premium products, excellent service and quality installation, it’s no wonder why over 350,000 homeowners chose Feldco for their home improvement.